I suspect that most first-time Camino pilgrims are a little apprehensive the night before beginning their walk. The guidebooks all talk about the difficulty of the long, first-day hike over the Pyrenees. Despite the practice hikes and training, it’s hard to know how your feet and shoulders will hold up on the day-to-day journey. And, the five weeks or so that most pilgrims take to complete the trip is more than most of us have ever walked at once time. Even though 15 miles per day sounds doable, walking enough 15-mile days to get to 500 miles is a little hard to wrap your head around. 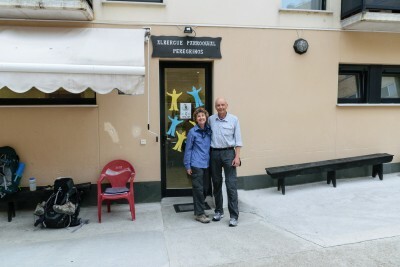 The night before we began our Camino, we stayed at the Beilari Alburgue in St. Jean. There, over a wonderful dinner, we heard both the excitement and concerns of other first-time travelers. 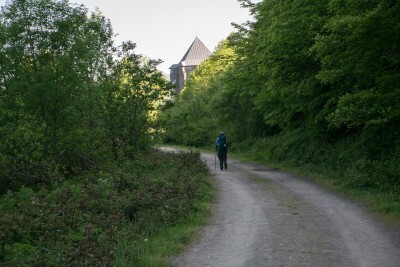 We began our walk–500 miles from St. Jean Pied de Port, France, to Santiago, Spain, on Wednesday, May 27. One advantage was a bit of flexibility in our trip. We’d made our plan reservations home to give us ample time in case we couldn’t keep up with our expected pace. So, we had some leeway in our starting date as well. We delayed our departure from St. Jean by one day–partly to give ourselves a day to look around St. Jean, but also because the weather was supposed to change from rainy to partly sunny. 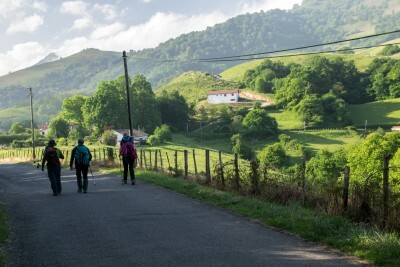 We’d heard, from volunteers in the Pilgrim Office where we obtained our Camino Passports and shell, that the weather in the mountains on the first day of the walk had been unusually cold and rainy–and that hiking over this beautiful section of the trail in mud and rain was not much fun. The forecast, however, was for clearing and warmer weather. The first day of our walk, we gathered in the street in front of the Beilari Alburgue for a photo with some of our new friends. Then, we headed off through the streets of St. Jean, bound for Roncesvalles, in Spain, on the other side of the Pyrenees. The morning was beautiful. The sun was shining, the air was fresh, and there were a surprising number of pilgrims heading out of the city at the same time we were. The road out of the city was steep, but the landscape quickly turned to beautiful farmland with green fields and picturesque houses. Flowers bloomed in gardens and in the ditches along the roadside. In fact, we made one of our first on-the-Camino introductions due to a wildflower. 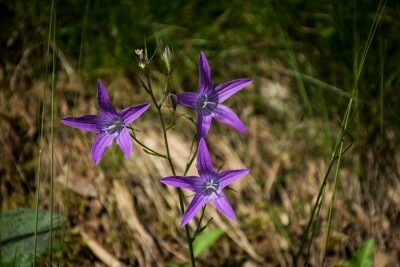 As we were walking out of St. Jean, I stopped to photograph a purple roadside flower. As I always do, I removed my sunglasses to compose the shot. I put my sunglasses on the ground beside the tripod while I took the picture. And, as I sometimes do, I packed up my gear and headed back up the trail to catch up with Chris without remembering to pick up my sunglasses! I was probably about 100 yards up the road when I realized I was no longer wearing my sunglasses. I immediately realized what had happened–and where I had left them. So, I turned around and headed back down the road. I was about halfway back down to the flower when a man following me up the road stopped and looked at the ground–just where I’d photographed the flower. He looked up, saw me hurrying down the road, and reached down to pick up my glasses. He had a big smile on his face as he carried them up and handed them to me. That was the beginning of our friendship with Georg, from Germany. We walked and talked with Georg quite a bit for the first week or so of our trip, until Pamplona, when we ended up getting a day or two ahead of him. Eventually, when I contacted him by email after the journey, I found that he had finished the trip to Santiago just a couple of days after us. The walk over the Pyrenees was one of the highlights of our entire trip. The weather was perfect: a gorgeous summer day with just enough breeze to keep us cool, lovely farms that turned into open range grazing as we climbed, flocks of sheep that wandered across our path, and views of shepherds tending sheep in the pastures around us. Making a hometown connection on the way to Roncesvalles. At a resting place on the way to the summit, we stopped to visit with two women. They asked me to take their picture with a phone camera–and then I asked whether I could take a picture of them with my camera. They agreed, and then we talked a little more about our excitement and the journey ahead. During our conversation, we found out that the women were from Portland, Oregon, just across the river from where we live in Vancouver, WA. In fact, one of them said she had previously lived in Vancouver. She wondered what part of Vancouver we lived in and she said she knew it well–including the grocery store where we shopped. As we were getting ready to walk again, I asked for one of the women’s email address so I could send her a copy of the photo I’d taken. After she gave it to me, she asked about our names and we told her. When she heard that our last name was Kramer, she paused–and then asked whether we had a son named Jeremy. We were astounded and said, yes, we did. Then she grinned and said that her daughter had been a good friend of Jeremy’s in elementary school. When she told us her daughter’s name, we immediately recognized her daughter as one of Jeremy’s friends. Although we’d never met the mom, she had driven Jeremy and her daughter to tennis lessons at the local tennis center for awhile when both of them were taking lessons. So, on a hiking trail over the Pyrenees, halfway around the world from our home, we met a woman whose daughter was a good friend of our son! We arrived at Roncesvalles in late afternoon. All of the regular bed spaces were already filled, so we were assigned places in the overflow section. The overflow rooms consisted of rooms with adjacent bunk beds–six bunks per room. I took a top bunk and Chris the lower. 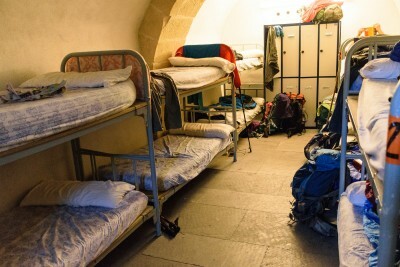 This was our first experience with true communal alburgue living: walking in and seeing pilgrims napping, reading, or just resting in their bunks, taking stock of the room arrangement in terms of where to set your pack, and then removing the items from the pack needed for the evening. The alburgue in Roncevalles was also the first place where we experienced communal snoring. I’m not sure what time it was, but not too long after the lights went out the snoring started. There were at least three large men whose on-and-off, blanket-shaking, bullfrog-like snores interrupted the sleep of everyone in the room. I think the only reason we were able to sleep at all was because we were so tired. We left Roncesvalles pretty early the next morning, a bit sleep deprived but excited to be on the second day of our journey. Our goal was to make it to Zubiri. Again, we had the advantage of a lovely summer day and hiking along both rural country roads and some farm-county trails. 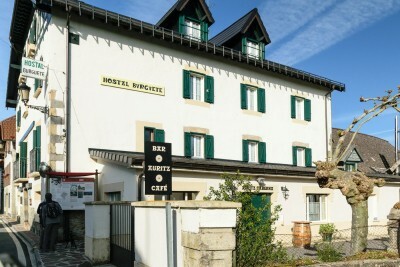 In the morning, we passed a hotel where Ernest Hemingway used to stay during his fishing trips to Basque country. I also heard my first Euopean Cuckoo. It happened while we were walking up a road, out of a small town. Suddenly I heard the sound of a cuckoo clock. I was surprised by the sound because I though we had left the town behind. So, I peered down the hillside, toward the sound, where I was certain there must be a clock tower in a part of the town hidden by the trees. After a minute or two or of scanning the hillside below and seeing nothing but trees I realized, with a bit of embarrassment, that there was no clock tower to be seen. I was, in fact, hearing the sound of a real cuckoo. That was the first of several cuckoos we heard calling over the next few days. And, yes, they sound just like cuckoo clocks! By the time we arrived in Zubiri, it was mid afternoon and hot. We had briefly considered going a little further, but we were beat and so we decided to look for a place to stay. We were still new at the whole process of locating alburgues–and there didn’t appear to be too many in Zubiiri. 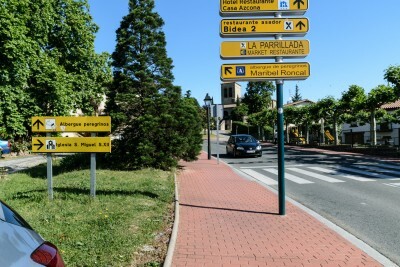 So, we started walking down the main street toward the municipal alburgue, which was listed in our guidebook. By guidebook description (and real-life appearance), it was a modest alburgue. I was ready to stay there, but Chris was hoping for something a little more upscale. After spending the previous night in the company of some very loud snorers, she wasn’t too excited about sleeping in a large community room again. We knew enough about Camino lodgings to understand that a pencion is an accommodation consisting of a private bedroom and shared bath. We asked about the price. It was a little more than we had planned to spend, but it seemed like an option at a time when we didn’t have many. So, we followed the woman into a nearby building and up an elevator to where she showed us the room. It was perfect: clean, private, quiet, and an ideal place to rest and catch up on our sleep. There was also a laundry room with a sink where we could wash our clothes and hang them out to dry on a clothesline that swung out from a window over the street below. After the night in the crowded bunk room of Roncesvalles, it was absolutely luxurious to have a room of our own. More than anything, we just wanted to stretch out on the beds. Later that night, we also had our first on-the-trail-washing-our-clothes-in-a-sink experience–something that we got better at as the trip progressed. Zubiri means “the village of the bridge” in the Basque language. 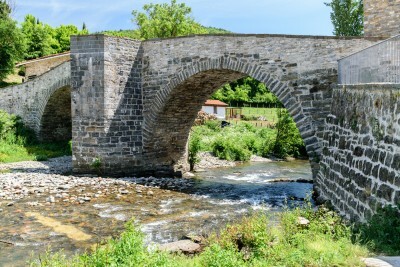 Zubiri is also the likely location of a former leprosarium The medieval stone bridge that we walked over (crossing the Rio Area) to enter Zubiri dates to the 12th century and is known as the Puente de la Rabia. The English translation means bridge of rabies. According to various legends, an animal walking under the bridge (or three times around its central pillar) could be cured of rabies. Or, animals that walked under the bridge could be protected from contracting various diseases, including rabies. 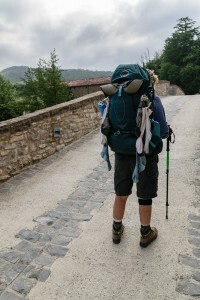 The following morning, as we left Zubiri, Chris had her socks hanging on the outside of her pack as we crossed the bridge, headed for Pamplona. Whatever the power of the bridge for curing disease, it wasn’t very helpful in drying heavy socks that were still wet from hanging on the line all night. It took most of the rest of the day and lots of flapping in the summer Spanish air to complete that task. On our walk from Zubiri to Pamplona, we stopped at a bar with a giant metal sculpture of a pilgrim. It was a popular breakfast spot with a case full of delicious pastries. Even though we’d only been on the trail for a couple of days, we were already getting used to the pilgrim habit of keeping an eye on the trail, watching passers by, as we sat at a table to eat and rest. We’d already met enough people to want to keep an eye out for anyone we might know. In fact, we had the chance to see and hear about many enthusiastic pilgrim reunions along the way. 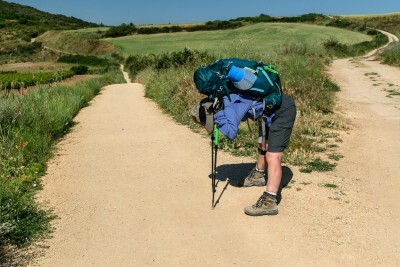 When you are walking the Camino, it’s not unusual to have wonderful conversations with another pilgrim (or two or three) for an hour, an afternoon, or even a day or two. Then, circumstances or a desire for a different pace or experience might separate you from someone you have very much enjoyed getting to know. We first met Patrick, from Germany, on the trail from Zubiri to Pamplona. Chris and I were walking with our two new friends, from Portland that morning. I thought it would be fun to get a picture of all of us together. So, I unstrapped my tripod from my pack and got my camera set up. As I was getting the camera/timer set for the photo, a jaunty looking fellow with a big smile came walking along the trail. Since we were blocking the trail, I jokingly asked him if he’d like to be in our picture. I didn’t expect him to say yes, but he did. So, that’s how Patrick ended up in our photo! By the time we reached Pamplona, we were beginning to feel like accomplished and experience pilgrims. I was beginning to have a few problems with blisters, and Chris was still getting used to the weight of her pack. But, we had crossed the Pyrenees, walked from France back into Spain, and we were now re-entering Pamplona. (Pamplona was the Spanish city we’d flown into before taking the bus to St. Jean). As a treat, we’d made arrangements to stay in the same Pamplona hotel where’d stayed before starting our trip, in the old part of the city. Pamplona has a population of about 200,000. After three days of rural walking, it was a change to walk into the streets of a bustling city. 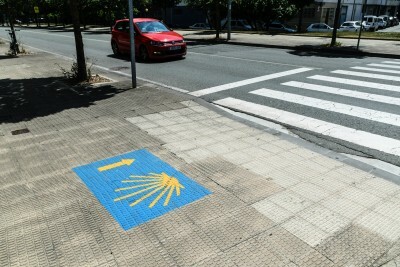 We picked up our first experience of following the Camino markers along the sidewalks across the streets of a metropolitan area. 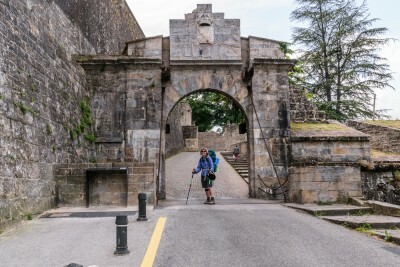 We found that in Pamplona, as in other large cities we crossed, the local people are used to seeing pilgrims and are very helpful at redirecting pilgrims who accidentally stray from the path. And, based on our personal experiences and those of others we saw, pilgrims were far more likely to lose the path in a city than they were in the countryside. After passing through the modern part of the city, we walked into the old part of Pamplona, alongside the massive stone walls that once guarded the city. Eventually, after climbing the old road into the city and crossing a working medieval drawbridge that is still raised and lowered once a year, we found our way back to the hotel where we’d stayed several days earlier. It was almost like coming home–and a bit of a luxury knowing that we’d once again have a room to ourselves. The walk from Pamplona to Puenta la Reina was unusual because it seemed that we spent a good part of the morning walking through the city of Pamplona. Part of that was because we made a bit of a detour to find a grocery story that was a little further off the trail than we’d anticipated. The detour was worth it for the chocolate-filled croissants that we ate for breakfast. But part of the reason for our long urban walk was that Pamplona is a good-sized city and we had to get to the other side. Eventually we reached some suburban areas and then, finally, open fields again. It was a relief to be back in the countryside. In the distance, we could see a high ridge, Alto del Perdon, with a line of towering wind generators. We knew, from the map, that Puenta la Reina was on the other side. It was warm by the time we climbed the steep ridge to Alto del Perdon (Hill of Forgiveness). According to a famous Camino legend, a medieval pilgrim climbing this ridge was dying of exhaustion and thirst. The devil appeared, dressed as a pilgrim, and promised to reveal the location of a spring if the pilgrim would renounce God. The exhausted pilgrim refused, multiple times. Then, according to different versions, either an apostle appears and insists that the devil provide the pilgrim with water or the devil disappears and St. James appears, revealing the location of a spring near the summit. We didn’t see a spring or a well, but there were lots of bikers pushing their bicycles up that part of the trail. 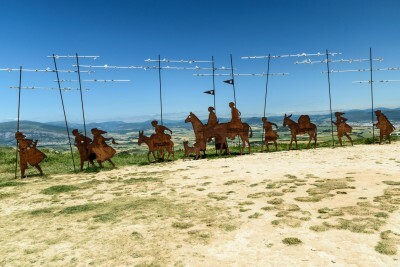 At the top of the ridge, a series of steel sculptures of pilgrims commemorate the Camino journey. The sculptures were installed by an artist named Vincent Galbete in 1996. An inscription reads: Donde se cruzado el camino del vent con el de las estrellas. The English translator is Where the path of the wind crosses with the stars. There are also enormous wind turbines lining this hill. We spent a few minutes resting and taking photos at the top, but the day was warm and we still had a ways to walk, so we soon headed down the other side of the ridge. There were lots of wheat fields on the other side, and the weather was hotter than anything we’d walked in so far. It was a relief to finally get into Puenta la Reina. Once we got into town we stopped at a bar to rest, have something to drink, and consult our guidebook about a place to stay. We got the impression, from talking to some other pilgrims, that many of the alburgues had already filled up. I think, by that point, we were back on the streets–and had walked to a couple of alburgues that had no vacancy. Back on the street, we met a couple of guys from Australia, Robert and Peter, who had found a place to stay in a nearby hotel. They pointed out a guy behind a bar who seemed to be one of the managers of rooms in the hotel. We talked with him, asked about the price, and then he took us through a couple of back streets and up the stairway in what seemed like an apartment building to show us a room. It was clean, it had a bathroom and sink for washing clothes, and we were hot and tired–so it was perfect. The following morning we got a reasonably early start. We were never the pilgrims who were up at the crack of dawn and headed down the streets at first light. Typically we tried to be on the trail by about 8:30 a.m. But I think we left Puenta de la Reina a little earlier than that. We’d walked around the city a bit the night before and saw the city’s 11th century bridge over the Rio Arga. Puenta la Reina means Queen’s Bridge. 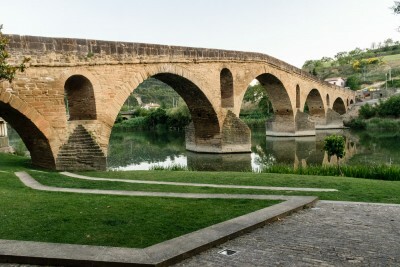 The bridge was apparently built at the request of Dona Mayor, the wife of Sancho III, to help medieval pilgrims cross the river on their way to Santiago. Its hard to walk over a bridge that has been in place for a thousand years without wondering about all the incredible stories of the hundreds of thousands of pilgrims who have walked across the same stone path over the centuries. Our destination that day was Estella. By the time we left Puenta la Reina, we were well into wheat country. The wheat fields were interspersed with groves of olive trees, and red poppies dotted the fields and drainage ditches alongside the roads. Later in the journey, Chris and I would sometimes walk apart from each other. She has a faster pace than I do, and not always walking together gave us a better chance to meet new people. On this morning, however, we were still hiking together. Even when we were together, she was often a bit ahead of me because I was always stopping to take pictures. But, this morning, I was hiking ahead of her. I think I had just stopped to take a picture of an olive grove when a lean, tan, fit- looking man came walking up from behind. Chris was with him. Instead of a pack, he was pulling sort of a wheeled travois. A rack between the rails held his pack. Chris had already talked to the man. She instantly recognized that he was a picturesque pilgrim and she knew I’d love to take a picture of him. She also knew that I didn’t take photos of random pilgrims without first asking–and she was concerned that he might pass me by before I’d had the chance to talk with him and ask about taking his picture. So, she stopped him and asked, before the two of them reached me, whether it would be OK for me to take his picture. That’s how we met Serge, from Switzerland. 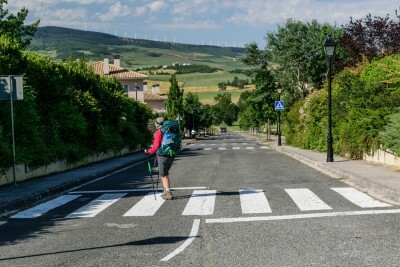 One of the common questions among pilgrims walking the Camino is to ask “Why are you walking?” It can be used as a get-to-know-you question. It also is a question that often results in remarkably candid, thoughtful, and emotional responses. After taking Serge’s picture, I asked him why he was walking the Camino. From that question, we learned that Serge had begun his Camino from his home in Switzerland. He explained that he left the house key under the front door mat and began his walk to Santiago on Easter Sunday. So, by the time we met him he’d already been on the road for more than a month. Serge took a photo of his pocket and showed us a picture of a woman who appeared to be in her 50s or 60s. He said it was his friend, and he had hiked many places throughout Europe with her. 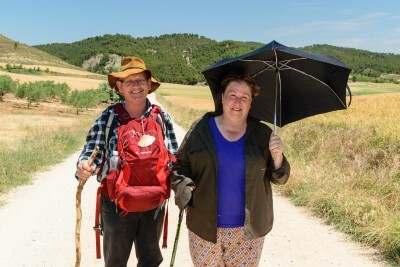 She had hiked the Camino about 10 years earlier and had always said, “Serge, you and I should walk the Camino together.” They agreed to do it–but the activities of their day-to-day lives kept delaying the trip. Then, unfortunately, Serge’s friend got cancer. She died before she and Serge had the chance to make their long-talked-about trip. “So,” said Serge, looking again at the photo, “I’m walking for my friend.” Then he pointed to his cart, where a well-worn wooden walking stick was strapped to his pack. “That’s my friend’s walking stick,” he said. I can’t remember exactly what we said after hearing Serge’s story. I do remember wishing him Buen Camino and he headed out ahead of us. He was clearly walking at a faster pace than us, and I knew that within a couple of days he’d be miles ahead and we’d probably never see him again. But, I did know that I wouldn’t ever forget his story. Serge’s story is just one of many remarkable stories we heard on the trail, in bars over lunch or dinner, or at alburgues where we met other pilgrims. There were stories about walking to recover from failed relationships, walks to take a break from a stressful job, walks at the beginning of the search for a new path in life, or even a walk to try to figure out whether God even exists. 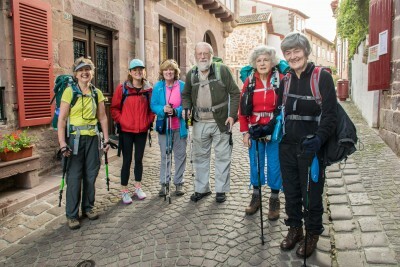 Although not everyone was walking for reasons like this–a sense of adventure or taking on a physical challenge were mentioned by many–the shared experience of walking along the Camino produces a remarkable sense of camaraderie. For many people, it seems to create a sense of openness and trust about sharing personal stories and feelings. 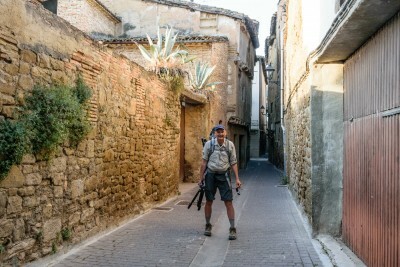 After having spent several nights in private rooms, we stayed in a parish alburgue in Estella. It was a donativo alburgue, meaning that there was no charge. Just a collection box where you could contribute whatever you’d like. As I was hanging my hand-washed clothes on a line, I noticed that the courtyard was surrounded by some very old crumbling walls. So, when I went back into the alburgue, I asked the attendant if she knew what the walls were from. She told me that they were part of the old wall that had once surrounded the city. When I asked how old they were, she said she didn’t know. But, she looked up the answer in a reference book in the office–and let me know that the walls dated from about 1000 A.D. It’s probably the most historic place I’ve ever hung my shirts to dry. The good news is that, despite being in a small room with at least a half dozen other metal-framed bunkbeds and thin mattresses, we got a good night’s sleep. The walk the next day from Estella to Los Arcos, marked a major (and happy) turning point for Chris. Up until this point, she had been carrying her full pack–which turned out to be a bit of a struggle. Chris is happiest when walking with no pack–and that works out pretty well when she and I are doing day trips. I don’t mind carrying her extra gear. So, I usually wear a large pack with my camera gear and shove in all of our extra clothes, emergency gear, and food. There’s no way, however, that I’d be able to carry all of Chris’ gear on the Camino. I believe it was in Pamplona, when we were leaving the hotel, that Chris noticed that the packs from our Portland friends were sitting in the hotel lobby, tagged for delivery to wherever our friends were planning to spend the next night. 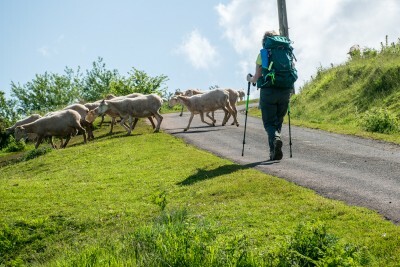 I’m sure that, in the reading we’d done about the Camino, we’d read about the courier delivery services that will drive your pack from your morning destination to wherever you’re planning to spend the night. You don’t even have to be certain of the exact alburgue. You do have to know the name of the city where you intend to sleep. But, you can specify any alburgue and, if that one is full or you decide to stay elsewhere, you just pick up your bag when you arrive and carry to your final destination. Chris had been thinking about this option ever since leaving Pamplona, and she finally decided that it would make the trip far more enjoyable for her. As a bonus, the price is reasonable. In most areas, the pickup and delivery only costs 7 Euros. You just put the money in an envelope, write the destination on the outside, attach it to your pack, and call one of the delivery companies. Like magic, your pack is sitting at the destination when you arrive. For some reason, we weren’t able to arrange a pickup up Chris’s pack from the alburgue where we stayed. I can’t remember whether the morning pickup had already occurred or the alburgue wasn’t on the list of pickup locations. In any case, we had to walk around the city for a bit to find an alburgue or hotel where we could leave Chris’s pack. She was determined to find a drop-off spot before leaving Estella. Eventually, we found a nice hotel with a kind woman who may have seen the desperation in Chris’s eyes. She explained the whole process of tagging the bags, helped us get the right number of Euros into a courier envelope that she supplied, and showed us where we could leave Chris pack to be picked up with the others from the hotel. From that point on, Chris carried only her hiking poles, a water bottle, and a fanny pack. She left Estella with a light heart and a light pack–and the decision was a good one because it made the rest of the journey so much more enjoyable for her. 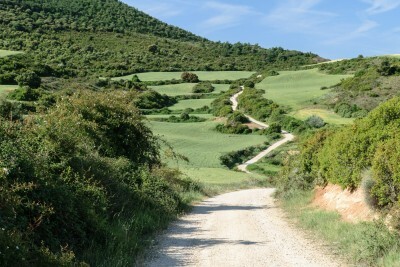 On the way to Los Arcos, we took an alternate Camino route for severals miles that was describe as more scenic. Along the way we had amazing views of the ruins of St. Stephens castle. The trail led through a hilly region with lots of woods. Although we managed to stay on the trail, we met a girl from Ireland who said she’d gotten lost in the woods for awhile. Toward late afternoon, as we were nearing Los Arcos, we got onto a hot, sunny stretch of unpaved road. Ahead, in the distance, I could see a couple walking. The woman was carrying a black umbrella. I loved the look of the couple–and took a couple pictures of them as I approached from behind. I always figured that, as long as I wasn’t taking recognizable pictures of people in situations like this, I didn’t need to ask their permission. As I passed them, however, I decided to talk with them. They were an absolutely delightful couple–and awfully cute as well. So, after talking with them for awhile I asked whether I could take a proper picture of them from the front–and they agreed. So, that’s how we met, and I have a photo of, Jeff and Rita from Australia. 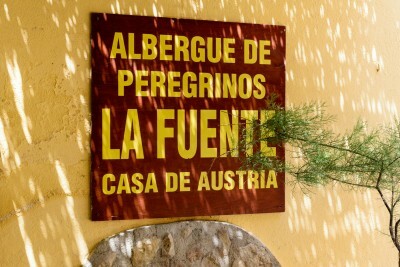 That night, in Los Arcos, we stayed in the Austria Alburgue. The rooms had two bunkbeds (room for four people) and the cost was 11 Euros per person. So, we figured that at a reasonable cost we had a pretty good chance of getting a good night’s sleep. One of the pilgrims staying with us was someone we already knew, Karla from the Netherlands. She told us that she knew she was a snorer, so she had a tennis ball that fit into a pocket on the back of her pajama top to keep her from rolling over an sleeping on her back at night. There was a vending machine in the alburgue that sold cans of beer, so I bought both some beer and soda–which we drank in the room. Then we walked into town to check out the plaza before returning to the alburgue to wash clothes and shower. It was a good (quiet and snore-free) night.